Joan is a small bag with a daring and elegant design. It is made for those who like to wear a striking yet practical accessory. Indeed, Joan is quite a small bag but you might be surprised by how may items actually fit inside. In fact, it is designed to hold all the essentials such as keys, a phone, change or cards, sun glasses and other small items… It is the perfect companion for a night out or special occasions but it is also great for everyday use. Joan is made of leather and its lining is made of thin but strong and waterproof textile. A zipper runs along its back, giving ample access to the main compartment. The bag’s leather handle is lined with a leather cord, making it strong yet thin and elegant. Two eyelets are placed on the top of the bag: the handle runs from the outside through these eyelets to the inside of the bag and is held in place inside with two knots. Two more eyelets are placed on the lining inside the bag and enable the endings of the handles to be neatly tucked away. The handle can be adjusted in length easily: simply loosen the knot, shift its position and pull it closed again. The surplus of the handle stays hidden between the lining and the bag’s outer layer. 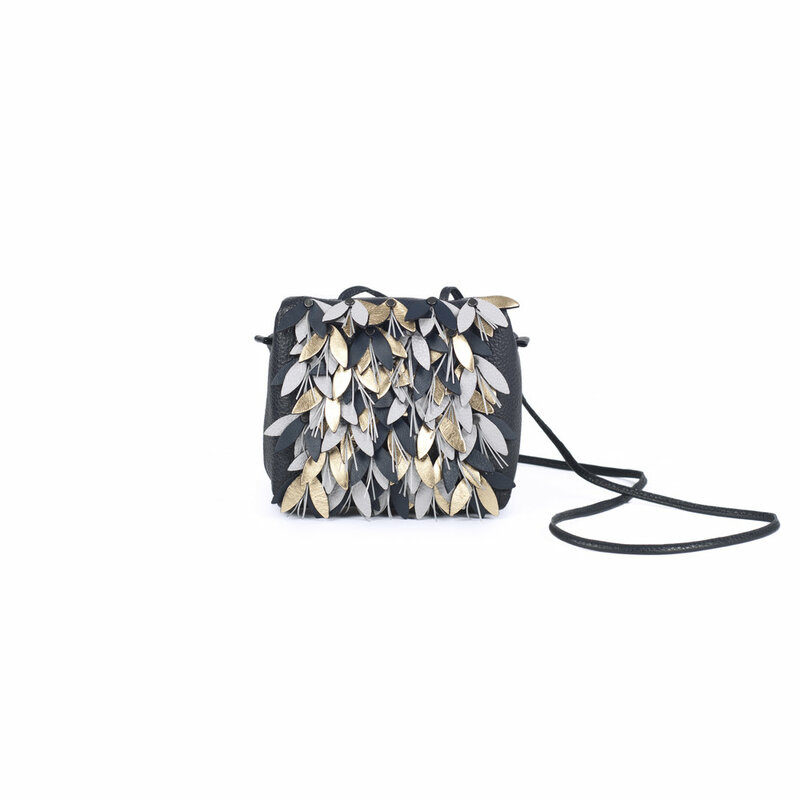 The full front surface of the bag is covered with a pattern made of leather leaf-shaped pieces and thin retro-reflective strips, held together with rivets. The retroreflective strips increase the visibility of the bag and its wearer at night.